– How does Tim Tebow (9 for 20, 104 passing yards, 8 rushes, 68 yards, 1 rushing touchdown) keep doing this? He doesn’t have the mechanics of a good NFL quarterback, but does that really matter at this point? He is winning football games for the Denver Broncos. They are now 4-1 with Tebow at QB. The offense is now built around him in a way that they can compete, win games and most importantly, hide his deficiencies. He has completed a grand total of 11…..yes, 11 passes in the last 2 games, and the Broncos won both of them. I guess if it isn’t broken, don’t fix it. 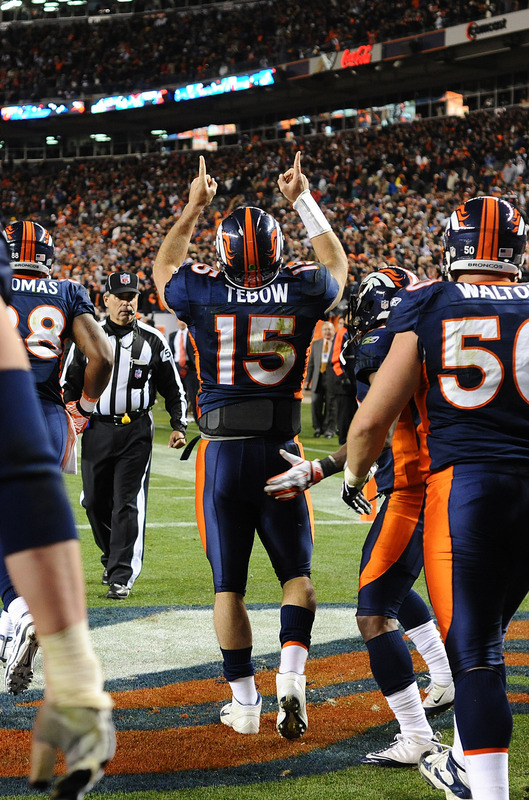 – Not only has Tebow emerged as a winner, but he is also proving to be quite the leader. A 95 yard game-winning drive at the end of the game against a stout New York Jets defence didn’t just appear out of thin air. The Broncos believe that they can win games with Tim Tebow, and if that is enough to rally this team to a playoff berth, then all the power to them. – What does this say about Rex Ryan and his Jets defense? One of the most balanced and accomplished defences in the NFL….couldn’t stop a guy who a week earlier, completed 2 passes. 1 sack and 1 forced fumble against a mediocre offensive line and an inaccurate QB aren’t the kind of defensive numbers Jets fans were hoping for. 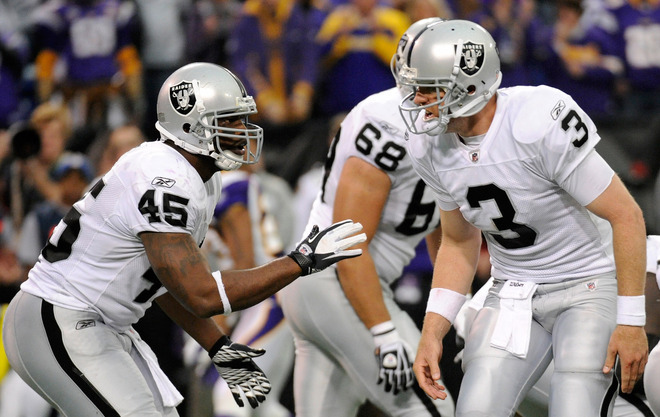 – It was nice to see Raiders QB Carson Palmer (17 for 23, 164 passing yards, 1 touchdown) have a game where he didn’t throw 3 interceptions. He seems to be finding some comfort now in the Raiders offense, and may end up being a better fit for this team than Jason Campbell was. – The x-rays on Adrian Peterson’s (6 rushes, 26 yards, 1 touchdown) ankle were negative after A.P injured himself during the first half. Even if he were to miss some time, would it really matter? The Vikings have nothing to play for now, besides getting QB Christian Ponder (19 for 33, 211 passing yards, 2 touchdowns, 3 interceptions) some more on the field experience and seeing if he is the future leader of the Vikings. – I always wonder why all NFL teams don’t institute a 2 RB system into their offense. The Vikings are one of those teams that simply don’t have a suitable back-up to their star Running Back. Who knows what Toby Gerhart (7 rushes, 18 yards) can do at this point. He may be thrust into a lead back position if A.P does miss some time. 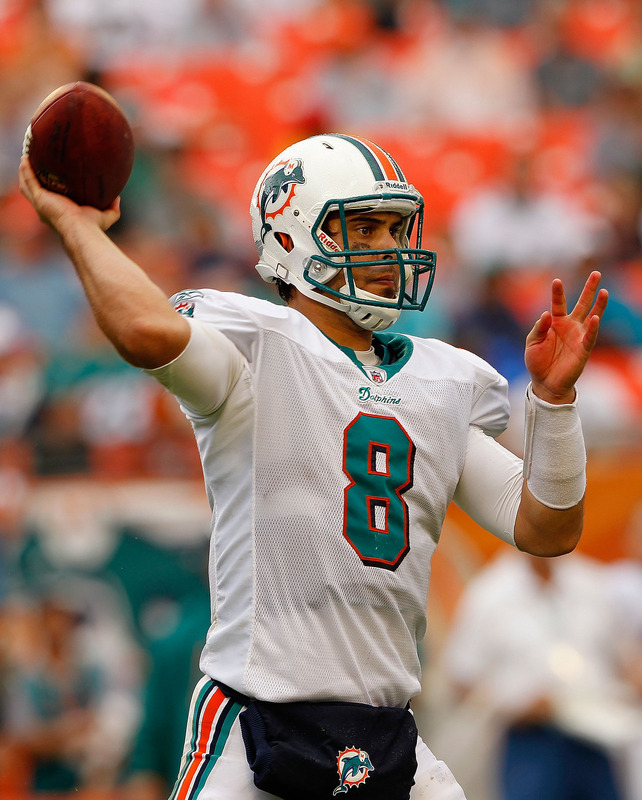 – I hope Dolphins fans aren’t looking to much into the performance of Matt Moore (14 for 20, 160 passing yards, 3 touchdowns) over the last 3 weeks. It’s nice that he has led them on a little bit of a hot streak, but he is not the future of this football team. He had a similar spurt of luck in Carolina, and we all know how that ended up. I guess Andrew Luck is out of the question. – What happened to the Buffalo Bills? One minute their the talk of the NFL and a sleeper to make the playoffs, and the next, their losing 3 straight and back down to earth at 5-5. This was a winnable game for the Bills, and a definite missed opportunity. – Dolphins RB Reggie Bush (15 rushes, 32 yards, 1 touchdown) now has 4 touchdowns in his last 3 games. He will never be confused for a lead-back, but it does show that Bush still has some pep in his step. – Bengals QB Andy Dalton ( 24 for 45, 373 passing yards, 1 touchdown, 3 interceptions) finally shows that he is what he is….a rookie QB. Not having your top receiver in A.J Green would make life difficult for any QB, but if Dalton made better decisions throwing the ball against the stellar Ravens secondary, and cut down on his turnovers, then this could have been a W in the win column for the Bengals. Despite going 0-2 against the Steelers and Ravens in past weeks, the Bengals were very much in both contests and proved that they are no fluke. But being “very much” in games and not winning games will not equal a playoff berth. – It’s nice to see Ravens rookie WR Torrey Smith (6 catches, 165 yards, 1 touchdown) have another standout game. With Anquan Boldin (1 catch, 35 yards, 1 touchdown) being held in check for a majority of the game, it was nice to know that the Ravens at least have another receiver they can go to. – I would say that things look good for Baltimore coming up, with games against the Browns, Colts and Chargers still on the schedule, but you can never be to sure with these Ravens. Defeating a up-and-coming Bengals team is a nice start, but Baltimore has to start taking care of teams that they are supposed to defeat, and not dropping games like they have against the Jaguars and Seahawks. – And the award for “the game that means absolutely nothing to anyone, perhaps not even to the fans in the stadium” goes to…..
– For all of the fantasy football fanatics out there, Browns RB Chris Ogbonnaya (21 rushes, 115 yards, 1 touchdown) did have himself a solid outing. 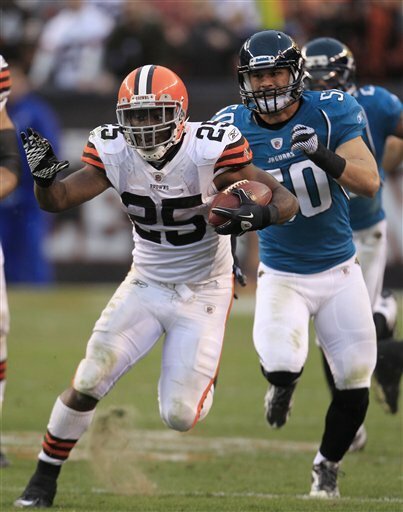 I guess someone has to run the ball for the Browns since “Madden Cover-boy” Peyton Hillis can’t seem to get himself on the field. – A tale of 2 teams with 2 young Quarterbacks. Colt McCoy (17 for 24, 199 passing yards, 1 touchdown, 1 interception) and Blaine Gabbert (22 for 41, 210 passing yards) both show promise, but it is too early to tell at this point. You could be much worse off than having a young, promising QB that you can mold and groom for your team. – Don’t look now, but the Dallas Cowboys are now tied for the top spot in the NFC East. Tony Romo (23 for 37, 292 yards, 3 touchdowns) torched the Redskins through the air, and how could he not with weapons like Jason Witten (3 catches, 85 yards, 1 touchdown), Dez Bryant (3 catches, 68 yards, 1 touchdown) and Laurent Robinson (4 catches, 34 yards, 1 touchdown). 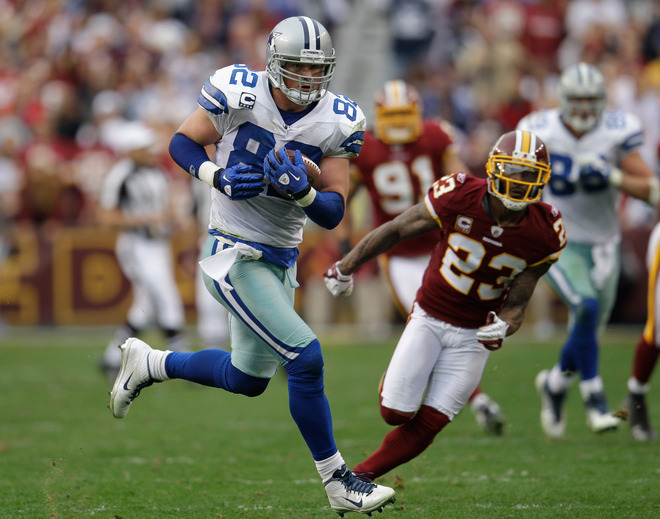 – The Washington Redskins still can’t figure out who their top Running Back is. Roy Helu (8 rushes, 35 yards), Ryan Torain (5 rushes, 4 yards) and former Cowboy Tashard Choice (6 rushes, 7 yards) all saw the field, but no one showed that they could carry a consistent load. I suppose this Merry-Go-Round of RB’s in Washington will continue for the forseeable future. – Just because Felix Jones (5 rushes, 18 yards) is back from injury, doesn’t mean the lead-back spot in Dallas is his. DeMarco Murray (25 rushes, 73 yards, 6 catches, 32 yards) should remain the starter for the rest of the season. Whoever says you can’t lose your starting job because of an injury doesn’t know what they are talking about. 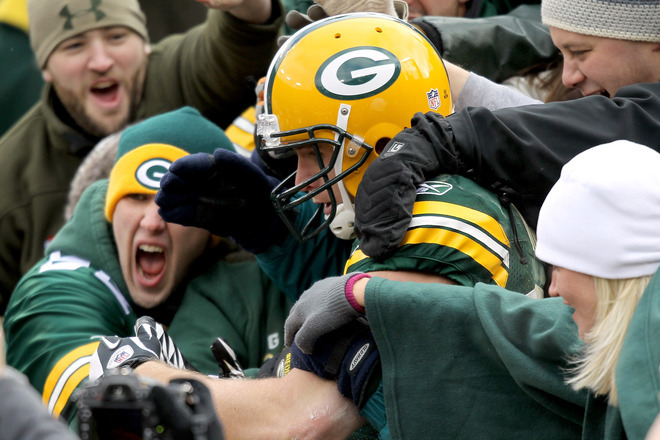 – The Green Bay Packers continue their undefeated season, moving to 10-0 on the year. Aaron Rodgers (23 for 34, 299 passing yards, 3 touchdowns, 1 interception) continues to show that he is the best QB in the NFL and that he is clearly going to run away with the MVP award this year. – Despite the final score, the Buccaneers put up quite a fight. QB Josh Freeman (28 for 38, 342 passing yards, 2 touchdowns, 2 interceptions) was able to eat up the Packers secondary for the most part, and RB LeGarrette Blount (18 rushes, 107 yards, 1 touchdown) was able to have a successful day running the ball, even though half of his yardage came on 1 play (probably the run of the year in the NFL). They may have lost, but they showed the NFL that the Packers can be had and that going undefeated for the entire year will not be easy. – It was good to see WR Mike Williams (7 catches, 83 yards, 1 touchdown) finally break out of his slump. I expected this to be a break-out year of sorts for the 6’2 receiver out of Syracuse, so hopefully this will get Williams back on the right track. 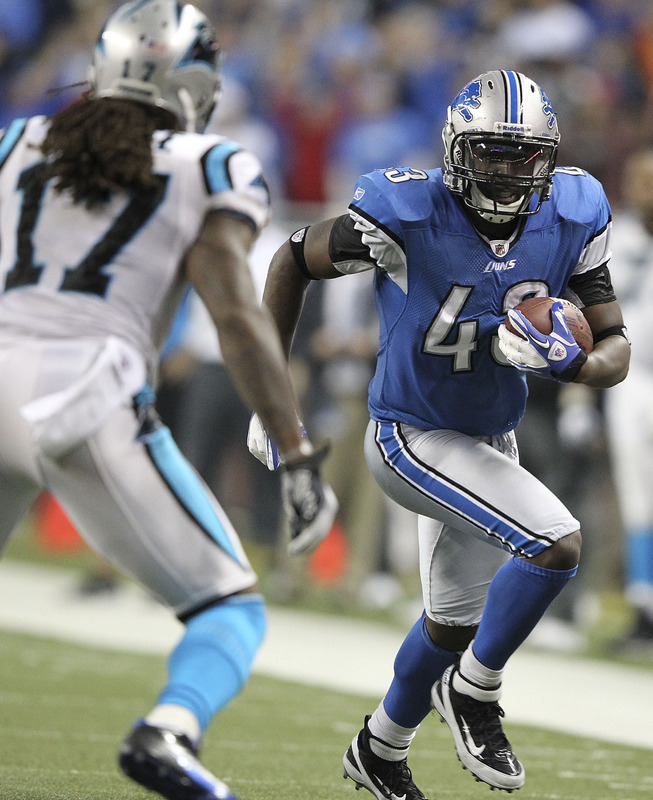 – Welcome back to the Detroit Lions Kevin Smith (16 rushes, 140 yards, 2 touchdowns, 4 catches, 61 yards, 1 touchdown). This guy was without a job 2 weeks ago, and now he has returned home to Detroit and put on the greatest performance of his career. I can’t say for sure how much of it was the poor Panthers defense and how much of it was Smith itself, but what a welcome back that was. Just another weapon in Matthew Stafford’s arsenal. – NFL fans may be blinded by Cam Newtons (22 for 38. 280 passing yards, 1 touchdown, 4 interceptions, 7 rushes, 37 yards, 2 touchdowns) powerful arm and elite ability to run the ball at his position, but he still has a long way to go before we mention him in the same breath as a Rodgers, Brees or Brady. He now has more interceptions (14) than touchdowns (12). The talent is there, and over time it will all come together for Newton. It is just a shame that he doesn’t have the talent or the defense around him to aid him in his growing process. – The 49ers defense took a QB in John Skelton (6 for 19, 99 yards, 3 interceptions) that just defeated the Philadelphia Eagles the week before, and made him look like the below-par Quarterback that he truly is. San Francisco has the best defense in the entire NFL. There better than the Ravens, Steelers, Packers…..all of them. – The one thing I worried about for the Niners was there lack of credible receiving threats outside of TE Vernon Davis (5 catches, 67 yards, 1 touchdown). It has been a sign of good things that WR Michael Crabtree (7 catches, 120 yards) is finally living up to his potential and giving Alex Smith (20 for 38, 267 passing yards, 2 touchdowns, 1 interception) one more weapon. 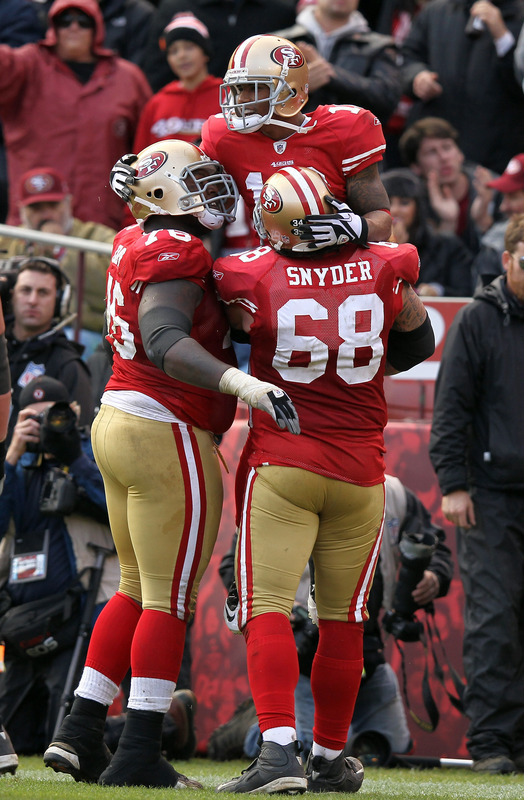 The 49ers defense is good enough to carry the team, but if the offense becomes a threat, then watch out. – And the runner-up for “the game that means absolutely nothing to anyone, perhaps not even to the fans in the stadium” award goes to…..
– The struggles of QB Sam Bradford (20 for 40, 181 passing yards, 1 touchdown, 1 interception) continue. It is hard to evolve as a QB when your only credible receiver to throw to is Brandon Lloyd (5 catches, 67 yards, 1 touchdown). The raw talent is there, he just needs more pieces to work with, on offense and defense. – The biggest news coming out of this game is the injury to Bears QB Jay Cutler (18 for 31, 286 passing yards, 2 touchdowns, 1 interception). 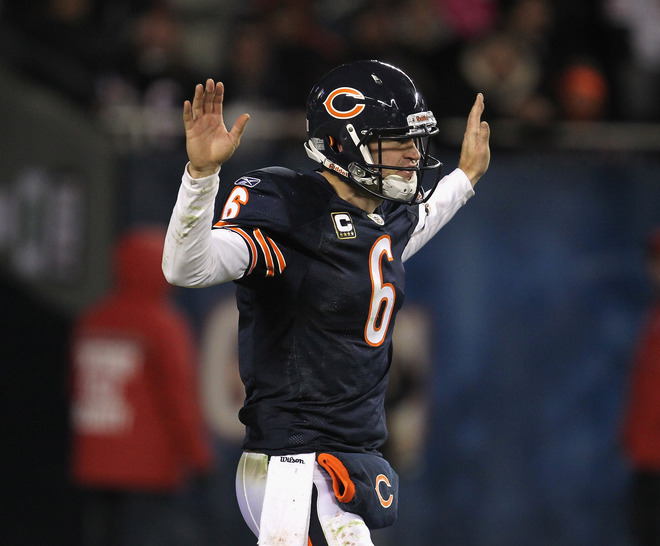 Cutler is expected to miss 6-8 weeks after breaking his thumb trying to make a tackle. For a team that has high playoff hopes and dreams, this is devastating. RB Matt Forte (21 rushes, 59 yards, 4 catches, 26 yards) better get used to having every single offensive play include him, because that is the only way the Bears can survive at this point. – After yesterdays loss, the San Diego Chargers now sit at 4-6 and LAST in the AFC West, behind the Broncos, Raiders and Chiefs. Even I can’t explain why the Chargers have fizzled out. Playoffs? Yeah right. 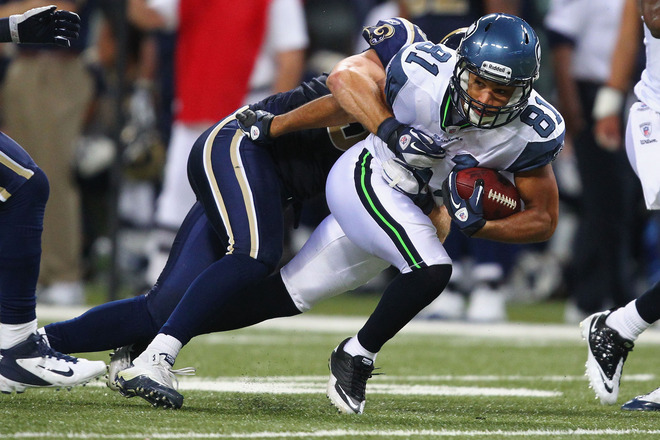 – Johnny Knox (3 catches, 97 yards, 1 touchdown) finally emerged as the deep-threat the Bears desperately need. No more Jay Cutler at QB may make this game a mirage down the road, and he should never be considered one of the best at his position, but you could do worse for a deep-threat on your football team. – The NFL world got its first taste of QB Jake Locker (9 for 19, 140 passing yards, 2 touchdowns) as the leader of the Titans offense after Matt Hasselbeck injured his elbow. He showed the promise and potential he was projected to have coming out of Washington. Hopefully Hasselbeck won’t miss a lot of time, as the Titans are still in the midst of a playoff race. Locker is the future, but the future shouldn’t be right now. – So much for Chris Johnson (12 rushes, 13 yards) breaking out of his slump. Ever since he got that new contract, he has played like 1/4 of the runner he is. Johnson has become the biggest individual disappointment in the NFL. How the Titans are 5-5 is a testament to how well Hasselbeck and the defense have played this year. 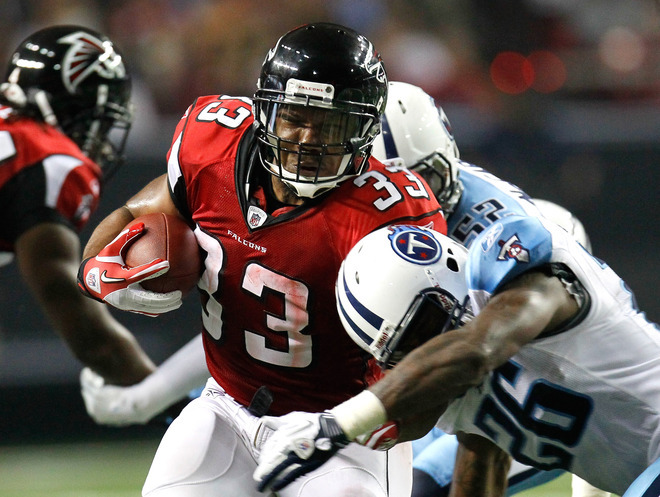 – Good bounce-back game for the Atlanta Falcons after that unfortunate play-call last week that cost them the game. Matt Ryan (22 for 36, 316 passing yards, 1 touchdown) needs to continue playing at this level for Atlanta, because after last weeks loss, every game counts now. The NFC playoff race is extremely tight, so Ryan and the Falcons need to continue to bring their “A” game on a weekly basis. – How did the New York Giants not win this game? No Michael Vick and a back-up who has seen limited action in Vince Young (23 for 36, 258 passing yards, 2 touchdowns, 3 interceptions) should have equaled a win. The Giants have a Brutal schedule ahead, so they needed this win. Now the Giants are tied with the Cowboys for the lead in the NFC East. – WR Victor Cruz (6 catches, 128 yards, 1 touchdown) has been a huge revelation for the Giants this season. 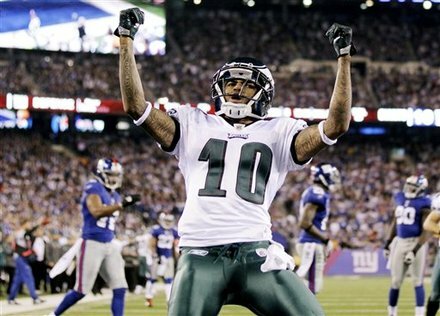 He has taken over the role of slot-receiver for the Giants…a role once filled by now Eagles receiver Steve Smith (1 catch, 14 yards, 1 touchdown). Despite being behind Mario Manningham (1 catch, 4 yards) and Hakeem Nicks (3 catches, 69 yards) on the depth chart, Cruz has still found a way to produce, and produce well. – The Philadelphia Eagles certainly haven’t called it a season just yet. Despite being 4-6, they can still mathematically make the playoffs. Vince Young had a good enough game to secure the win, but he isn’t the solution long term. Michael Vick must return to help salvage the season. 1. The Eagles essentially would need to run the table and win out the rest of their schedule to make the play-offs, while not impossible, that is a terrible spot to be in. 2. Cutler’s injury could be devastating to the Bears. We may very well see that next week. Their D is great, but can it win enough games to make the playoffs? 3. I “lol’d” at the “game that means absolutely nothing to no one…” awards, well played. 4. The 49er’s are a scary team. They may be the most complete team in the NFL (besides GB, maybe). Smith is playing up to his potential, Gore is one of the best RBs in the league and that D is just too good. 5. It’s going to be tough for the Bengals to get into the playoffs now. Having lost to the Ravens and Steelers, they’ll be fighting for that second wildcard spot most likely, and that’s never a spot you want to be in. 6. *selfish warning* I wish Adrian Peterson hadn’t gotten hurt for two reasons, 1, he’s on my fantasy team, and 2, the Raiders may have lost the game, putting the Raiders and Broncos in a tie for top of the AFC West. 7. Yay for Tebow and the Broncos! He just keeps winning and just keeps making the experts look like fools. It’s awesome, everyone keeps saying he can’t keep it going and he does. If he gets the Broncos to the playoffs, does he deserve to be mentioned as MVP? Rodgers has probably been the best player this year, I can’t argue that, but he has a very good team around him, Tebow may be the most valuable player to that team right now.